While it was a busy weekend with two IAAF Diamond League meetings, a national 10,000m track event, a European Cup race walk event, a big BMC meeting, the Loughborough International and a British Masters Road Relay Championships, there was plenty of other action elsewhere too. A report from the opening Diamond League event of the year in Doha can be found here, while a Shanghai report is here. 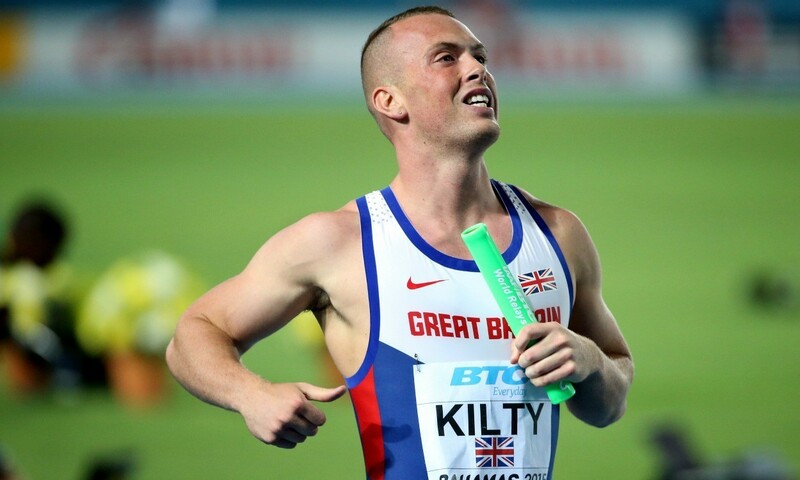 World and European indoor 60m champion Richard Kilty (pictured above at the World Relays) won the 100m in a PB 10.09 to top this year’s UK rankings and he won it easy as second-placed Filippo Tortu crossed the line in 10.33. In a separate race, Leon Reid ran a 10.34 PB. European silver medallist Matthew Hudson-Smith had an even easier win in the 400m as his 45.79 individual season opener was the only time inside 47 seconds. Germany’s Paralympic, world and European long jump champion Markus Rehm broke his own T44 world record, leaping 8.29m (+1.6m/s) on his third attempt. The mark adds five centimetres to his previous best which he jumped when winning the German able-bodied title last year. Italy’s world long jump champion Martina Caironi leapt 4.60m to equal the T42 world record set by Germany’s Vanessa Low last year. Dutch Paralympic, world and European sprint champion Marlou van Rhijn clocked 25.99 for 200m to shave 0.19 from the T43 world record she set at the London 2012 Paralympics. Liam Ramsay finished second behind winner Pawel Wiesiolek of Poland with a score of 7752 points in the decathlon, while David Hall was fifth with a score of 7517 points in his first ever decathlon with senior implements. Hall scored 77 points more than his score with junior implements at the World Junior Championships in Eugene and was 183 points short of the British Athletics qualifying score for the European under-23s in Tallinn. The pick of his performances was a meeting record and PB 400m of 46.46 which earned him the men’s individual award of the meeting. That mark broke what had been the oldest Multistars record, with fellow Briton Mark Bishop having set the previous record in 1989. In the heptathlon, Commonwealth Games competitors Jess Taylor and Jess Tappin placed 8th and 10th respectively with scores of 5483 and 5379 in an event won by Greece’s Sofia Yfantidou with 5900 points. Mark Dry was among the winners as Jess Ennis-Hill continued her comeback. Read more in an online report here. Jonny Mellor and Rhona Auckland won the elite races at the 25-lap festival in north London. Further details can be found in an online report here. Alison Leonard and Andy Butchart were among the winners at the first BMC meeting of the year. A more in-depth round-up is here. Pole vaulter Jax Thoirs bettered his own Scottish record with a clearance of 5.65m. South African Olympic finalist Anaso Jobodwana improved his 200m national record to 20.06 from the Anguillian record of Zharnel Hughes who ran 20.15. In fourth, Britain’s Delano Williams continued his good form shown over 400m to clock 20.40 over half the distance. Trinidad’s Machel Cedenio won the 400m in 44.36 to go second in the world lists. There were world leads for Dedric Dukes in the 200m with 19.99 and in the women 400m hurdles for Shamier Little’s 54.68. World hammer champion Pawel Fajdek and world shot champion David Storl broke the meeting records with respective throws of 82.76m and 21.72m. Nick Miller continued his top-class from with a second place in the men’s hammer behind Fajdek with a throw of 76.21m. Taylor Campbell improved his UK junior hammer record with the 6kg implement to 76.85m. Cambridge dominated proceedings in the historic Oxford versus Cambridge Varsity match at Cambridge, winning both the 141st men’s and 41st women’s Blues matches, as well as both second team matches. Britain’s biggest women’s-only run saw 7000 entries and the runners were led in by Gemma Rankin, who won in 35:31, a minute clear of Gillian Palmer. The nine team titles went nine different ways. A report can be found online here. Clare Donald won the W55 10km event in 39:35 while Pauline Rich won W70 gold in 52:54. M65 Ian Richards won the 10km walk event in 51:50. Bahrain’s Eunice Kirwa broke the course record with 69:37. Kenya’s James Rungaru won the men’s race in 62:21. There was a Kenyan double as Alex Oloitiptip Korio and Angela Tanui won the men’s and women’s 10km races in 29:20 and 33:34 respectively. A round-up report can be found here. Andrew Douglas of Scotland West and Yorkshire’s Emma Clayton won the first event in the British Athletics Mountain Running Challenge series. Douglas clocked 45:26 ahead of Middlesex’s Chris Smith with 46:15 and Yorkshire’s Tom Adams with 47:17 as Yorkshire topped the team standings from Scotland East and Scotland West . Clayton ran 40:29 to beat Annie Conway (40:35) and Sarah McCormack (41:05), both of Cumbria, which meant Cumbria took the team win from Yorkshire and Scotland East.